The Funky Felter: The Funky Felter is sponsoring a giveaway contest at PoshMama.com! 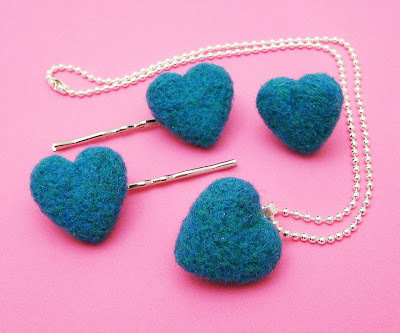 It is your chance to win a set of felted hearts (ring, pendant, and hairpins)! The Funky Felter is sponsoring a giveaway contest at PoshMama.com! It is your chance to win a set of felted hearts (ring, pendant, and hairpins)! Capitolagirl on Etsy contacted me last week to be a giveaway sponsor for a site that she moderates and writes for called PoshMama. I thought it would be a great way to introduce myself to the PoshMama community so I was happy to fulfill her request. The giveaway item is a felted heart set. It is a complete jewelry set of turquoise needle felted hearts. You can see them in the photo above. If you are interested in participating in the contest, click here and follow the instructions at the end of the "Friday Finds" article. Please don't leave your comments here to enter, you need to visit the PoshMama site to do that. Also, if you don't already have an account with PoshMama, there is a simple signup process to go through, but I think that a chance at winning my felted heart set is worth the signup time! i love that color! what wool did you use?